Two generations in the past, an all-out nuclear war ruined the cities of the world and led to the question of whether technology and scientific knowledge are worthwhile pursuits. The new ruling class of America, the agrarian New Mennonites, said no. Machines, electric power, atomic energy all come from the same source–evil. The New Mennonites enacted the 13th Amendment, a de facto ban on cities and progress. Civilization now stands still in the middle of a wheat field. 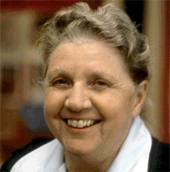 Leigh Brackett (1915-1978) is best known for her career as a Hollywood screenwriter. Among other works, she penned, at least in part, two great Raymond Chandler adaptations: The Big Sleep and The Long Goodbye. And she also cowrote a little sci-fi picture known as The Empire Strikes Back. 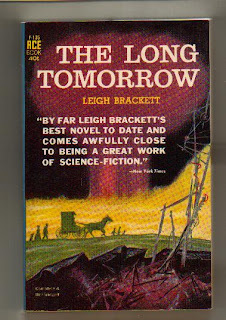 Many of her novels and short stories were seen as pulp, which isn’t accurate, at least in the case of The Long Tomorrow, a novel that is decidedly literary. The narrative follows two young New Mennonite boys, cousins Esau and Len Colter. They live a small community called Piper’s Run. But they long for more. They desire a place where ideas are freely exchanged and machines aid human civilization. The main catalyst for these desires is the boys’ grandmother, who tearfully recalls her childhood days when planes filled the air, cars and busses crowded the streets, and folks had leisure and luxury. After witnessing the horrific stoning of an outsider thought to be from the mythical “Bartorstown” (perhaps the last city) and coming to realize the limits of New Mennonite living, the boys set off to find this last refuge of human progress. However, Bartorstown may not exist. Or it may not be what they think it is. If it’s out there, it’s somehow connected to a traveling trader named Mr. Hostetter. And the journey contains many obstacles: lust, jealousy, ignorance, and fanaticism. The West, for instance, has wandering bands of New Ishmaelites, a group that renounces all possessions and who frequently and randomly rise up violently against the followers of the flesh (i.e., everyone who isn’t a New Ishmaelite) when called by God in a moment of religious ecstasy. And in the end, the boys must decide which is more frightening, the monster closely regarded in its cage or the monster pushed to the fringe of society and ignored. And just what is this monster anyway? This entry was posted in 100 list, apocalypse, religion, Reviews, social sf. Bookmark the permalink. It’s fascinating to see how some sf novels stand the test of time and others don’t. I still have my old Mayflower pb of “The Long Tomorrow” which I purchased c1963, and reread it from time to time. Doing so produces most curious feelings, like going through a timewarp of some kind. Perhaps the oddest is the surprise at finding the Amish (on whom the New Mennonites are explicitly modelled) cast as the Bad Guys. This, I suspect, would be out of the question today. If their treatment by Hollywood (“Witness”, “Harvest of Fire” etc) is anything to go by, they are about the most popular ethnic minority in America. To chide them for holding up “progress” would be almost unthinkable.The book shows its age in other ways too, notably its simple 1950s faith in technology. It’s now some 80 years since World War III, yet the group at Bartorstown are perfectly happy living next to a prewar nuclear reactor. Even those who for various reasons aren’t happy with it don’t seem to fear any physical danger, save of course from the neighbours if they ever find out. These days, I suspect few would be keen to live even near an eight year old one. Yet Bartorstown has lasted three generations without even a Three Mile Island, let alone a Chernobyl. Remarkable workmanship.Ditto for the people. There are some who’d rather not be living there, but after eight decades in a country hostile to all it stands for, Bartorstown still hasn’t been betrayed. Could anyone really keep the lid on for so long? Quibble, quibble, Mike.In short, TLT is a remarkable glimpse of “The way the future was”. If it were written today, I suspect the Mennonites would be definitely the guys in white hats, and the young heroes would not merely get out of Bartorstown, but do their best not to travel downwind of it any more than they absolutely had to.